The Waco Friends of Peace was a signatory to a new declaration of Independence for our times which appeared as a half page ad in the New York Times July 3, 2008. We joined 600 others in signing and funding this declaration. Signatories from Texas included Hadi Jawad, Rick Halperin and the Freedom and Justice Foundation. The text began: "When in the course of human events the government becomes destructive of the ends for which it was established, it is the right of the people to alter it and demand restoration of those Constitutional principles that have so long assured their liberty, safety, and happiness. Therefore, on the anniversary of our Independence, we offer this new declaration for our times." The text addresses presidential usurpation of power, illegal surveillance, signing statements, torture, violation of international treaties, imprisonment of lawful immigrants, and massive governmental secrecy. PRICE: All free. donations accepted. Synopsis:FROM CANADA Since World War II North Americans have invested much of their new found wealth in suburbia. It has promised a sense of space, affordability, family life and upward mobility. As the population of suburban sprawl has exploded in the past 50 years, so too has the suburban way of life become embedded in the American consciousness. Suburbia, and all it promises, has become the American Dream. But as we enter the 21st century, serious questions are beginning to emerge about the sustainability of this way of life. 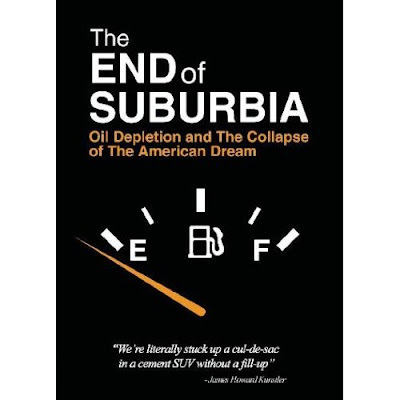 With brutal honesty and a touch of irony, The End of Suburbia explores the American Way of Life and its prospects as the planet approaches a critical era, as global demand for fossil fuels begins to outstrip supply. World Oil Peak and the inevitable decline of fossil fuels are upon us now, some scientists and policy makers argue in this documentary. The consequences of inaction in the face of this global crisis are enormous. What does Oil Peak mean for North America? As energy prices skyrocket in the coming years, how will the populations of suburbia react to the collapse of their dream? Are today's suburbs destined to become the slums of tomorrow? And what can be done NOW, individually and collectively, to avoid The End of Suburbia ? Hosted by Barrie Zwicker. Featuring James Howard Kunstler, Peter Calthorpe, Michael Klare, Richard Heinberg, Matthew Simmons, Michael C. Ruppert, Julian Darley, Colin Campbell, Kenneth Deffeyes, Ali Samsam Bakhtiari and Steve Andrews.